FILE PHOTO: Military vehicles are seen in the loading dock of the HMS Albion, the British Royal Navy flagship amphibious assault ship, after the ship's arrival at Harumi Pier in Tokyo, Japan August 3, 2018. A British Royal Navy warship sailed close to islands claimed by China in the South China Sea as it headed towards Vietnam, asserting "freedom of navigation" rights and challenging Beijing's "excessive claims" in the region, two sources said. 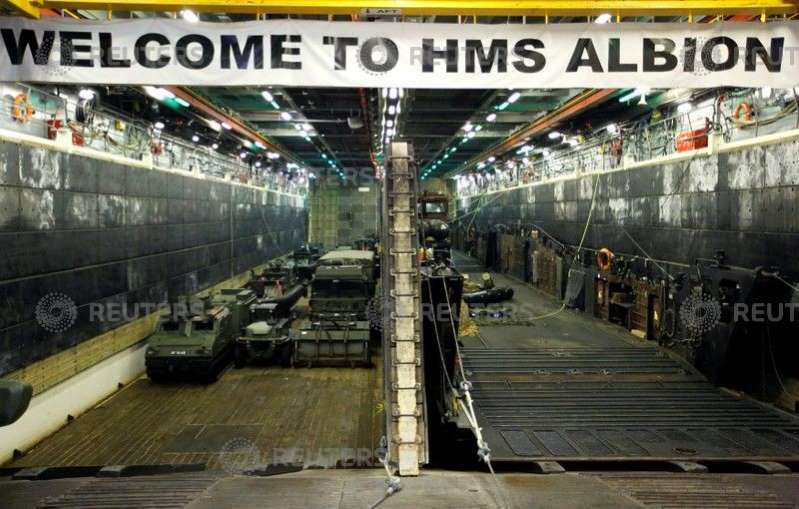 The HMS Albion, a 22,000 ton amphibious warship carrying a contingent of Royal Marines, passed by the Paracel Islands in recent days, said the sources, who were familiar with the matter but who asked not to be identified. Neither China’s Foreign nor Defence Ministries immediately responded to a request for comment. China’s claims in the South China Sea, through which some $3 trillion of shipborne trade passes each year, are contested by Brunei, Malaysia, the Philippines, Taiwan and Vietnam. Britain does not have any territorial claims in the area. The British Navy has previously sailed close to the disputed Spratly Islands, further south in the South China Sea, but not within the 12 nautical mile limit, diplomatic sources have said. FONOPs, which are largely symbolic, have so far not persuaded Beijing to curtail its South China Sea activities, which have included extensive reclamation of reefs and islands and the construction of runways, hangars and missile systems. Beijing says it is entitled to build on its territories and says the facilities are for civilian use and necessary self-defence purposes. China blames Washington for militarising the region with its freedom of navigation patrols. Foreign aircraft and vessels in the region are routinely challenged by Chinese naval ships and monitoring stations on the fortified islands, sources have said previously. In April, warships from Australia - which like Britain is a close U.S. ally - had what Canberra described as a close "encounter" with Chinese naval vessels in the contested sea.